Interior of a Thameslink carriage. The Class 387 Electrostar is an electric multiple unit (EMU) built by Bombardier Transportation for Thameslink, Great Northern, Gatwick Express, c2c and Great Western Railway (GWR), with the first delivered in December 2014. These trains are part of the Electrostar family which also includes classes 357, 375, 376, 377, 378 and 379. 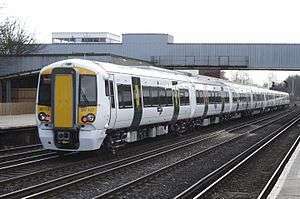 The Class 387 is an evolution of Bombardier’s Class 379 Electrostar with a higher maximum speed of 110 mph (175 km/h). This has allowed UK rail network operator Network Rail to release additional paths to train operators on routes with line speeds up to 125 mph (200 km/h) that are not available to vehicles restricted to 100 mph (160 km/h). The first Class 387/1s were ordered for the Thameslink route, which enabled the existing Class 319s to be transferred to Northern Rail for use on the newly electrified Manchester Victoria to Liverpool via Newton-le-Willows route. On behalf of the Department for Transport, Southern issued an OJEU notice in December 2012 with proposals received in January 2013. The invitation to tender for the fleet was released the following month with final offers being submitted by 18 June 2013. Southern announced it had signed a deal with Bombardier on 30 July 2013 for 29 four carriage units. The deal also included an option for 140 carriages which have since been taken up with 108 for Gatwick Express and 32 for Great Western Railway. The first Thameslink unit entered service in December 2014 with all in service by July 2015. Although always intended for use by Thameslink, they were delivered with interiors in Southern's green colour scheme, with Southern-style doors and Thameslink logos on the exterior. They are operated by Thameslink on services between Bedford and Brighton. The first Great Western Railway unit entered service on 5 September 2016 running between London Paddington and Hayes & Harlington in peak hours to relieve congestion on some of the country's most crowded trains. From January 2017, GWR intend to run a half-hourly Paddington to Hayes and Harlington service utilising pairs of these 387/1s. Gatwick Express 387204 at Crewe. As part of Govia's bid for the TSGN franchise, 27 four-carriage units were ordered to replace Class 442s on the Gatwick Express service, using some of the optional 140 extra carriages. The order was announced in November 2014 with the first units on test in July 2015 and they began to enter service on 29 February 2016. The deployment has been disrupted by drivers refusing to take passengers, claiming that the 12-coach class 387 trains are not covered by their driver only operation agreement which is limited to 10 coaches, and that running them without a conductor would be unsafe. In April 2016, c2c announced that it would operate six Class 387s until a fleet of 68 new carriages are delivered in 2019. The first c2c Class 387 was delivered in October 2016 and entered service in November 2016. They will be used to relieve overcrowding created after the introduction of the December 2015 Timetable. It was originally planned that once the 387/1s were released from Thameslink they would be cascaded to the GWR franchise. It will also receive eight new Class 387s, which will be built after the end of March 2016 when the 387/2 order for Gatwick Express is scheduled to be completed. They will replace Class 165 and 166 diesel multiple units on the newly electrified Great Western Main Line from London Paddington to Oxford and Bedwyn. In November 2015, Porterbrook announced it had ordered an additional 80 Class 387 carriages (20 four-car trains) to act as a buffer stock of trains guarding against future demand for electric units, with a number of operators already expressing interest in obtaining the use of them. In April 2016, c2c announced that it would operate six of the 20 additional units ordered by Porterbrook until a fleet of 68 new carriages are delivered in 2019. In June, GWR announced that they would be taking the other 14 units of the Porterbrook order, plus another 23 new-build units, to add to the 8 already under construction, and would not be receiving the 29 Thameslink units, which will instead be going to Great Northern. 1 2 "Bombardier to manufacture 116 new train carriages for Thameslink rolling stock cascade" (Press release). Southern. 17 July 2013. Retrieved 5 June 2015. 1 2 "Introducing our new trains". www.gwr.com. Retrieved 2016-09-30. ↑ "Govia and Bombardier sign Gatwick Express train contract". Railway Gazette International. DVV Media Group. 18 November 2014. Retrieved 5 June 2015. 1 2 "Late-February debut for Gatwick Express Class 387/2s". 1 2 "New trains boost to deal with 'unprecedented' demand". Railnews. 13 April 2016. Retrieved 13 April 2016. ↑ "Porterbrook orders Bombardier EMUs to meet future demand". Railway Gazette. 2 November 2015. Retrieved 2 November 2015. ↑ "GWR finalises Thames Valley EMU order". Railway Gazette. 8 June 2016. Retrieved 8 June 2016. ↑ "Trio of GTR Class 387/1s readied for move to Great Northern duties". PressReader. Retrieved 4 August 2016. This article is issued from Wikipedia - version of the 12/2/2016. The text is available under the Creative Commons Attribution/Share Alike but additional terms may apply for the media files.